Ask millenials and boomers what companies they value most and you’ll get very different answers. If brands want to make an impact with the consumers of the future, they need a clear mission. How can age-challenged brands mean more to younger people? In short, develop more meaning. Serving an older population is a great thing, so long as that’s what a company intends to do–like AARP serving those 55 and older. But some major mass-market brands mean much less to younger generations than to older generations–creating significant risk for the longevity of those companies. This year, my agency Enso’s World Value Index scored 150 brands according to how a nationally representative sample of Americans identify the brands’ purpose, the extent to which the purpose identified aligns with their own values, and the extent to which it motivates brand advocacy and purchase. The results are strikingly different for different demographics. For instance, Americans over 55 years old (“boomers”) rate Newman’s Own the No. 7 brand, whereas those 18- to 34-year-olds (“millennials”) rate Newman’s Own No. 81. Without building stronger support from younger generations, Newman’s Own risks declining sales over time and eroding the brand equity that the company has spent decades building. 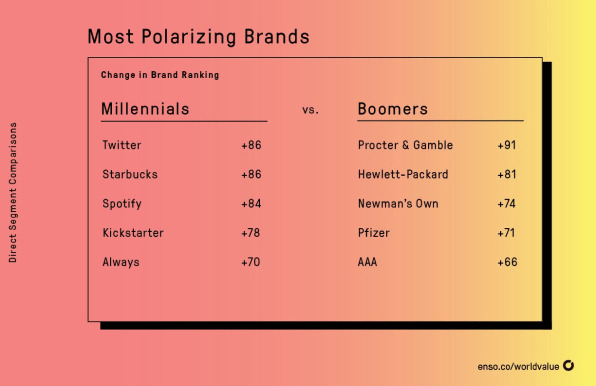 Similarly, AAA, Pfizer, and Samsung have significantly lower ranking by millennials than by boomers, and Levi Strauss resonates most with those age 35- and 54-year-olds (“gen-Xers”). The millennial generation is the largest in history–significantly larger than even the boomer generation–and reported to control $24 trillion dollars of wealth by 2020, so missing this generation could send brands into terminal decline. There are a few reasons why brands may underperform with younger people. In some cases, products become more relevant at older ages–Pfizer’s pharmaceuticals, for instance. In other cases, cultural mega-trends are against brands, like the declining importance of car ownership to younger people (affecting AAA and Chevrolet) or the declining attraction of smoking to young people (affecting Marlboro). For Newman’s Own, the cultural relevance of its iconic founder, Paul Newman, may naturally decline with time. But most brands do not have these forces against them–they may just be underperforming in this era relative to previous eras. Large, diversified packaged goods companies are often respected as the most sophisticated marketers in business, able to develop brands that resonate throughout customers’ lives. But gen-Xers rank Johnson & Johnson at No. 11 while millennials rank it at No. 40, despite its products being appropriate for all ages and millennials being the target market for J&J’s babycare products. Similarly, Proctor & Gamble is ranked No. 12 by boomers, but a lowly No. 103 with millennials–a huge disparity, despite spending more than $7 billion dollars per year in advertising (including efforts to make millennials care about fabric softener). Which brands are outperforming with younger generations? Unsurprisingly, a lot of web and tech companies like Twitter, Snapchat, PayPal, Spotify, Uber, and Kickstarter. But also some physical products like Starbucks (rank No. 111 by boomers, No. 25 by millennials), Honest Company, Chipotle, and H&M (rank No. 142 by gen X, No. 69 by millennials). How can age-challenged brands mean more to younger people? In short, develop more meaning. 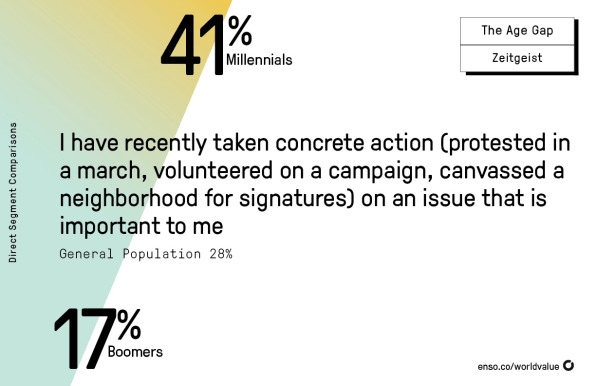 And millennials are personally acting on this intention: 41% say they have recently taken concrete action (like protesting in a march, volunteering in a campaign, or canvassing a neighborhood for signatures), whereas only 17% of boomers have. 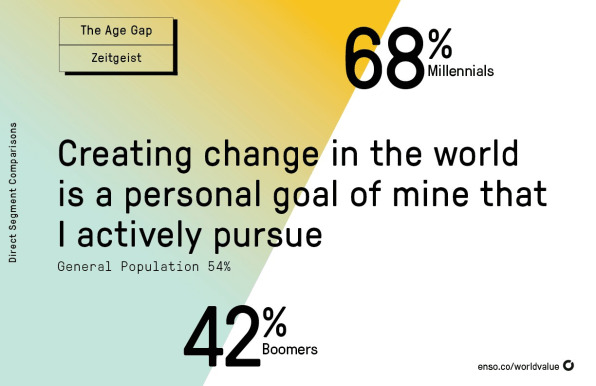 Having a global outlook and encouraging diversity are also traits that are likely to align millennials with brands: 77% of millennials say experiencing other cultures is important to them, whereas only 64% of boomers do. Resonating with these core motivations of young people–to affect the world around them, to be part of positive action, to experience other cultures–is clearly an approach to increasing brand relevance with those people. But a note of caution: Having a strong purpose does not absolve the need for effective communication. Newman’s Own’s travails with young people are partly because only 39% of millennials could identify any purpose in the brand, beyond making profit despite the company giving 100% of profits to charitable causes and championing organic food. Similarly, Pampers has done tremendous work in vaccinating against neonatal tetanus, but it’s possible that too-few Americans know about this initiative. Sometimes companies don’t do a good job engaging young people in the good work they do, and sometimes companies actively downplay good works out of a sense of humility. While humility can be laudable, younger people in particular are seeking greater impact and brands of meaning – and there’s a powerful role for brands to play in enabling that impact. Engaging more young people in impact sets up a virtuous cycle for the brand of increasing brand resonance, increased commerce, increased positive impact, and increased fulfillment for people. Both the substance of meaningful action and people’s perceptions of that action matter to long-term support of brands’ purposes. Young people are making brand choices–some of which will last a lifetime– in an era of dramatic political and cultural events. Those brands that stand in accordance with young people’s values will be more likely to “win the future” than those that do not fully understand them or ignore them out of risk aversion or ambivalence.